I am intrigued by the space between the physical world and the inner mind. Sensations and imagery that comes from this realm Is a great source of my creativity. The concept of infinity circulates in my mind when I am daydreaming or painting and I have a recurring phrase which keeps resurfacing in my thoughts; 'Behind closed eyes the world becomes infinite'. Working with oil paints on canvas, I connect better with my inner voice than with written or spoken words. 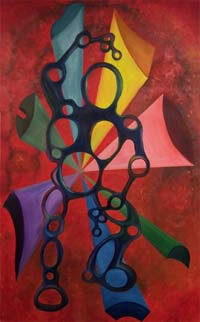 I love the vibrant qualities that oil paint possesses and the depth of its luster. The colours I choose and texture of my strokes reveal the essence of my emotion. The contrast between dark and light I comprehend as opposing forces, duality, and extremities. When subtly toning and shading, I often dispense with conventional tools and use my fingers, knuckles, or even my whole hand. This direct physical contact with the paint on canvas is almost an essential part of my process. I perceive this contact as yin-yang, unity and harmony. The figures I portray, provide a vehicle for motion, giving an additional dimension to internal thoughts, in a similar fashion to the way conventional body language does. The surroundings of the forms are an enveloping situation, related to eitheran inner or outer world. 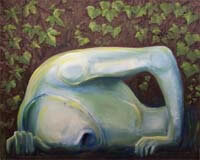 I am expressing in figurative form the surreal imagery, in relation to emotional constraints of defining environments. I am challenging the traditional concept of figurative painting and portraying 'the person' not as a beautiful or ugly object, but a complex bundle of emotional states. 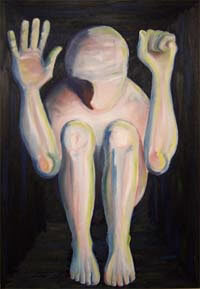 David Jagen's work is unique, original, emotionally charged and powerful. It has great potential to draw the attention of art critics and collectors of modern contemporary fine art in a highly competitive market. David is in the early stages of his career and difficult though it is to be professionally renowned in the art world, David Jagen is not content to confine himself to the ranks of the amateur. Collectors of David Jagen's artwork in the future will undoubtedly be proud to say they had the insight to invest in his artwork today.